The vertical arbor re-rip system designed for feeding stock to be re-ripped on edge. A splitter closely follows the saw blade and the scrap material diverted off the top of the horizontally running saw blade. The vertical arbor is quickly and easily adjustable up and down for the rip width desired. The stock is powered through the saw section by means of an endless timing belt feed system. Air loaded holdover rolls are employed to assure positive feed and position of stock during the cut. If air pressure fails, the machine will stop automatically. 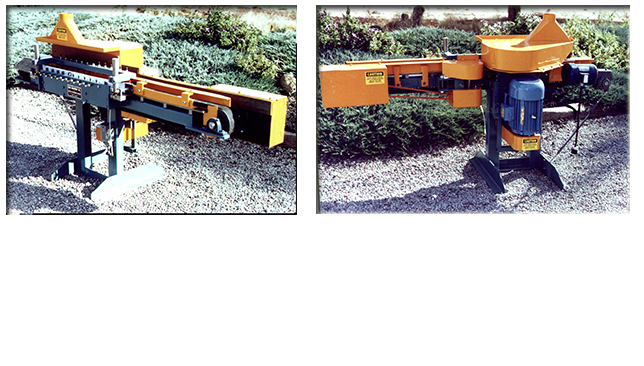 Each saw unit is manufactured to be very narrow so as to accommodate a “Crow Foot” configuration when several saws are required for multiple re-rip widths. The unit is complete with all motors, starters, Ten feet of powered infeed conveyor, air regulator/gauge/pressure switch, and six feet of outfeed bar.